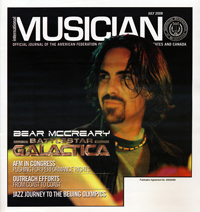 I’ve been getting some great press lately, especially for the last round of Battlestar Galactica concerts last spring. Here are some of the ones worth checking out. Click on the logos or links to read the whole article. Variety: Renowned film music critic Jon Burlingame wrote a wonderful article about me, focusing on my recent work on Battlestar Galactica. Hollywood Reporter: Ann Donahue’s review of our April concert. It’s also the source of the praise for this very blog that I felt compelled to put over on the right. Ain’t It Cool News: Scorekeeper wrote an amazing write-up of the April 13th concert, that includes an interview (both print and audio) with me and James Callis. He described the concert as “orgiastic” which I think means he liked it. :) Another of their reviews also sent in this review. 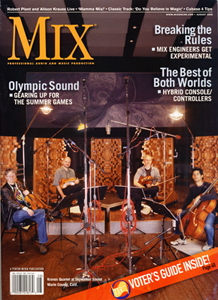 Mix Magazine, July 2008: This is the first article to interview my engineer and co-producer Steve Kaplan, so it gets into more interesting detail about the audio production process. Steve is a guy who never gets his fair share of credit for making my music sound incredible, so check this one out. New Jersey Star-Ledger: Alan Sepinwall wrote a compelling article about television scoring, focusing on Michael Giacchino and myself. Giacchino is clearly one of the most vibrant composers in the business today, so it was an honor to be included. You can also read the complete interviews with the two of us. IGN: Another great write-up of the show, with a particularly awesome picture of James. Soundtrack.net: An excellent write-up of our April concert.